maudineormsby wrote: I don't think Letang is doing the Jersey any favors by standing there like he got caught pinching and gave up a 2 on 1. I think they should bring back the Baby Blue jersey. Much better looking than these. LimerickPensFan wrote: I'm not happy. I've always hated yellow jerseys. On a side note, I think one of the major tragedies in the NHL is that the home team wears their dark jerseys. There are so many great unis in the league that we never get to see live because every game looks the exact same. Saying it's major might be a bit of a stretch, but I can't tell you how bad I hate it!! The roat team should wear their colors in your arena. You wear your colors and they wear bland white. Not sure I follow you there Jim. Me personally I am a great fan of the full colour uni (home) Vs road whites. It looks very clear on broadcasts in terms of contrast. The marketing department would hate you. They count on the revenues from the sales of the third jerseys. Here in Erie, the Otters switch what they wear on home ice. One half of the season they will wear the darks and then the other half would be the whites. I always thought that was a nice little thing that they do. Different sport and for different reasons, but down here in South Florida, the Miami Dolphins often wear their away whites for home games. Main reason, however, is because of the heat and humidity, they'd rather have the away team in the dark jerseys that are going to absorb the sunlight and make it more difficult for the other teams. The Raiders game a few weeks ago was one of the hottest games I've been too, and that couldn't have been fun in those black Raiders jerseys. Later in the season when it cools off, or any home night games, they'll wear the normal dark home jerseys. Apparently Wheeling now has a 3rd jersey that mimics the parent club third. 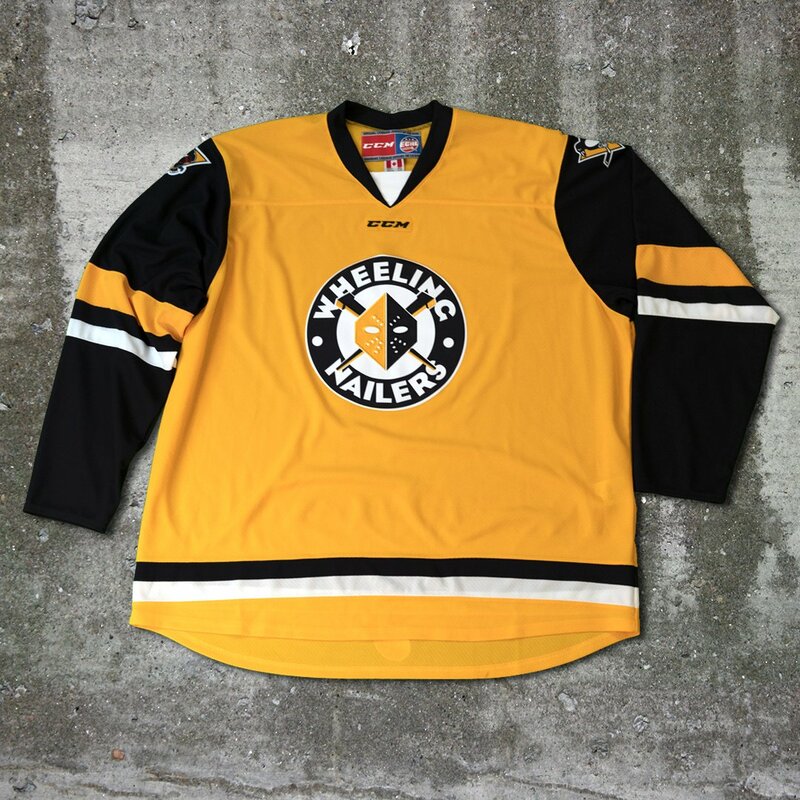 relantel wrote: Apparently Wheeling now has a 3rd jersey that mimics the parent club third. FLPensFan wrote: Different sport and for different reasons, but down here in South Florida, the Miami Dolphins often wear their away whites for home games. Main reason, however, is because of the heat and humidity, they'd rather have the away team in the dark jerseys that are going to absorb the sunlight and make it more difficult for the other teams. The Raiders game a few weeks ago was one of the hottest games I've been too, and that couldn't have been fun in those black Raiders jerseys. Should be like soccer really... the home team chooses their "kit" and the road team adapts. Sometimes you'll have a blue jersey St. Louis versus a red jersey Chicago, why not? Why does one have to be white? Since the change of home jerseys to dark, ALL Penguins have feature black vs white... 300+ games of black vs white. B o r i n g.
Before that when the Pens would use white at home, you would get white vs blue, white vs red, white vs teal, white vs black and all sorts of variations. Some leagues play half a season using dark at home, the other half using white. That would also be cool by me. The NHL used to switch at the all star break which is fine by me. You really shouldn't do 2 non-white colors because people that are color blind would have trouble. Every home game should not look the exact same as it does now, I can't stand it and seems like such a simple change! I think the era of the black and white TV is over. Both teams should wear whatever sweaters they want. Why not mix it up with the old crest instead of going with a copy of the winter classic? Boring. Did they try to save money by not designing a new jersey? Or were the organisation so happy with the winter classic one, that they figured it was a shame not to give it more time? 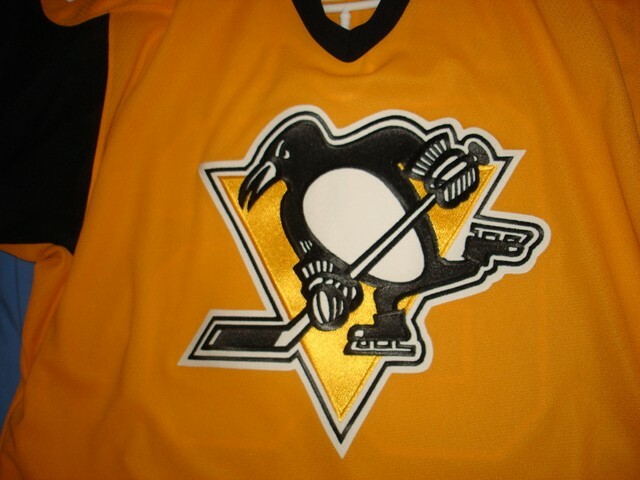 They should bring the Pittsburgh one back next year. Or, in homage to those ugly early 90s some teams were doing (like the slugs and Gordon Fisherman) - maybe 1 with a bridge or 3. Well, everyone should get one more chance at their "wish" jersey. They won't use these for the Stadium Series game... so there should be another one coming, right? Unless both teams just wear their 3rds. 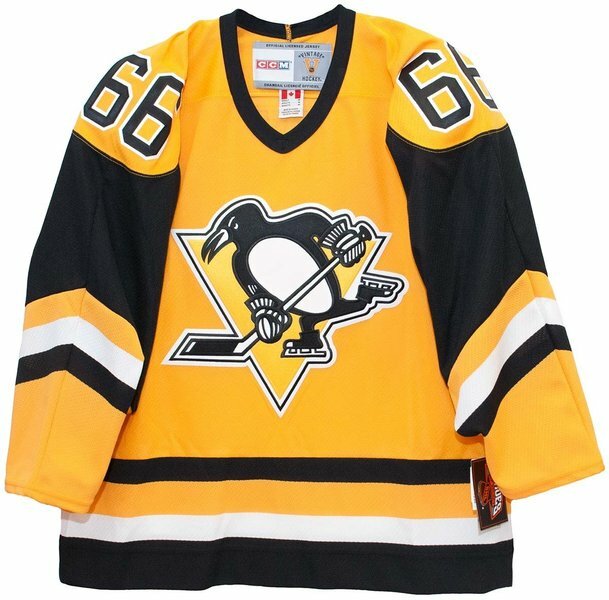 I like the new jersey, but what I really want is the Crosby Kenyan jersey! There is one big reason why I don't think this would fly very well, and that is, cost to the team. There would be a sizeable, noticeable cost to teams throughout the season. If you are on Twitter, check out Dana Heinze feed and look at some of the pictures he tweets of the Penguins packing gear for road trips. It's A LOT of equipment. You throw in a whole other jersey for a road trip, you have to bring different helmets, pants, socks, gloves, etc. I'm just throwing out random number here, but if a team pays 5K per road game to haul their road gear, you are now possibly doubling that if you go on a 3 game road trip where 2 teams want you to wear your whites and another team wants you to wear your dark jerseys. I do think switching after the all-star break would be a great idea that the league should consider. Switching at the all-star break is how it used to be and probably the easiest to do. If you go with white all the time at home, which I would prefer, there will probably be a handful of season tix holders who will complain because they never get to see the black. If they switch it halfway, it's an improvement but still miss the opportunity to see some of the best jersey's in the league for teams that only come in once (Calgary, Edmonton, Chicago). There's actually quite a few articles about the NHL jersey protocol. I've been going to games since the mid 70's, and have had season tickets since 1985. The Pens always sore white at home. The only year they switched at the All Star break was in 2002-03, in preparation for the switch to the home team wearing the darks at home. Many of the reasons for and against are the same now as it was then. By the 1940s, some teams began wearing contrasting colors, but in 1950, the NHL made it mandatory for the home and away teams to wear contrasting jerseys. The advent of television—black and white at the time—also necessitated contrasting jerseys so viewers could follow the action. At that time, home teams wore dark jerseys and the visitors wore white. In 1970, the NHL changed course and began using the system hockey fans grew used to: The home team wore white and the visitors wore dark jerseys. The change brought more variety to each rink. If you were a fan of the Bruins, for example, every game at the Boston Gardens back in the 1960s looked the same: Bruins in black, opponents in white. In Detroit, it was always the Red Wings in red and the visitors in white. In 2003, though, the NHL changed course again. It didn't hurt to give the fans a fresh look after 32 years, but the real reason for the reversal was to boost the sales of team jerseys. NHL teams had started designing and wearing "third jerseys" and vintage, or "throw-back," jerseys" as teams resurrected abandoned logos and colors from years past. Teams wanted to show off these new (or old, as the case may be) sweaters at home, where loyal fans would dash to the souvenir stand to buy their own. Most alternate jerseys are dominated by dark colors such as black and crimson and mustard. So road teams had to travel with two sets of uniforms, just in case an opponent wanted to have a third-jersey night, thereby forcing the road team to don its whites. To simplify all matters, the NHL decided to reverse the light-dark jersey protocol. In rare cases when the vintage jerseys are white, the league allows the home team to wear white and the visitors to wear dark jerseys. The Pens were way ahead of the curve in terms of third jersey, as the new one is a replica of the alternate home jersey they wore from 1982-85, down to the numbers on the shoulders. Which is unusual for an NHL team. I did notice the Panthers have their numbers on the shoulders. Maro wore thes only as a rookie. I was excited about the switch in 2003, but I really wouldn't mind a switch every year at the all star break. I do miss seeing the colorful uniform schemes throughout the league. It's nice to see the Pens dark jerseys, but it truly makes it a black and white game every night. I didn't realize it until you pointed it out. I didn't mind the vintage gold jerseys worn in Mario's rookie season, but not including the golden triangle makes me much less enthused. I'm fine with a replica from '82-'85. Why change them? I always thought the triangle was as big a part of the logo as the skating penguin.